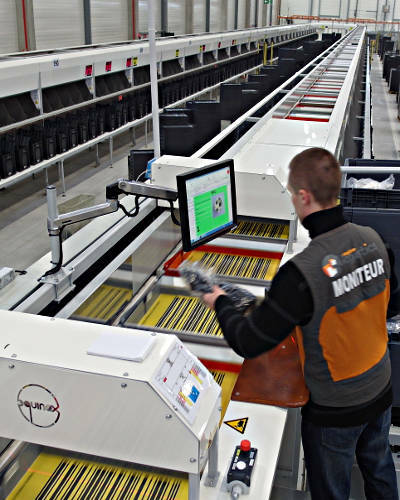 Oxylane, Decathlon’s parent company (€ 6.5 billion turnover / 53,000 employees) has fitted its warehouse in Bussy-St-Georges with a new generation sorting machine. The 33,000 m² warehouse includes a sorting machine with 530 stations capable of sorting more than 28,000 pieces per hour. This makes this machine the most important sorter in the Oxylane network. The installation of Oxylane Bussy meets the increasing demands of the market and the ultimate goal is to cope with the growing supply of goods of various brands of the group such as: Decathlon, Kipsta, Oxelo, B-twin, Quechua or Kalenji. With this new sorting machine, Oxylane Bussy gains in efficiency, fluidity and the productivity of the 110 employees of the site. In order to guarantee the activity of the Oxylane’s brands, TRANSITIC has developed a distribution concept based on the sorting of articles thanks to an automatic detection, specially designed for Oxylane Bussy. TRANSITIC installed a WOFS type sorter for large-sized applications, and the operator simply places the items directly on trays that open below their destination container. Once sorted, items slide to the plastic bins. The system, managed by the EXACT sort control software, executes all queries related to the database and communicates with the sorter’s hardware management programme and the user interface as well as the induction program. With this system, Oxylane Bussy’s warehouse will be able to sort more than 28,000 pieces per hour.